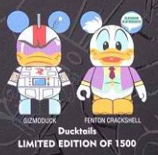 Unlike series 1, the second series of Disney Afternoon boxes have the other figures printed on the box. The first combo of series 2, Duck Tales Gizmo, was released today at D-Streets and Online. Thanks to Austin for the photos. 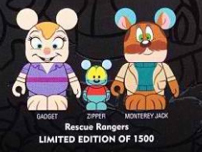 And we already know about the Rescue Rangers 2 pack featuring Gadget, Zipper and Monterey. Each combo is an LE of 1500. So excited to see some villains. I’m super excited to get Negaduck, Bushroot, and Don Karnage. The only thing about getting Bushroot and Negaduck is now I want all of the Fearsome Five. Liquidator would look awesome on a clear figure.